It was easy for Tyler Nevin to fall in love with baseball. The son of former big league slugger and current Reno Aces manager Phil Nevin spent his formative years in clubhouses at both the Major and Minor League levels observing every move. During his dad's time with the San Diego Padres, Nevin distinctly remembers playing Wiffle ball with closer Trevor Hoffman, a future hall of famer and one of only two men in history to eclipse 600 saves. That can have a way of shaping you. 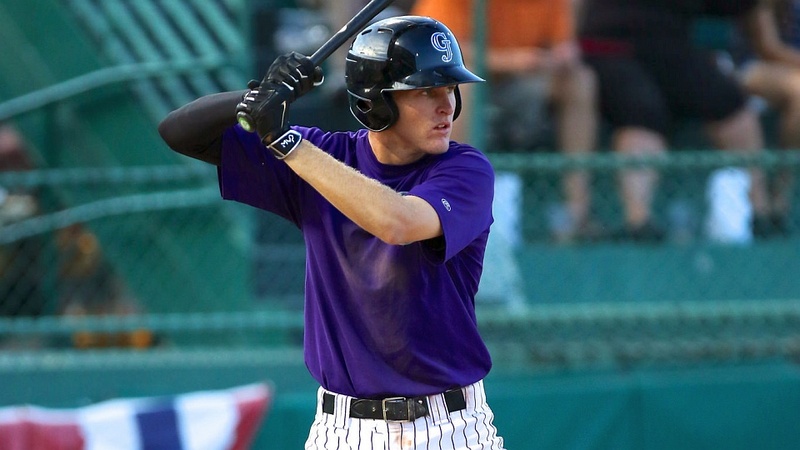 "It was definitely an advantage," said Nevin, a third baseman in Grand Junction. "I got to see what this life is really like. What people normally learn by trial and error, I already had a sense of what I should and shouldn't be doing. It's not something most kids have." Nevin's pedigree is now being tested as a first-year pro and a high Draft pick of the Colorado Rockies (No. 38 overall) in June. The right-handed-hitting Nevin, just 18 years old, chose to forgo a scholarship to UCLA and kick-start his professional career immediately. He came to the Rockies out of Poway High School in Poway, California, as a gap hitter with good size -- 6-foot-4 and 200 pounds -- and what scouts deemed "plus makeup" with the potential to develop a power stroke. "The home runs will come, I feel," said Nevin, who was hitting .237 without a homer through his first 10 games. "But my approach is to work everything up the middle, hit line drives and hit the ball hard. "I try to do the fundamentally sound things to get guys over and play the game the right way. I'm not giving away any at-bats. I go into the game with a mindset and try to execute." Early on, Nevin was also a pitching prospect. He was the closer on his high school team as a sophomore when he could reach the low 90s on the radar gun. But his velocity suddenly dropped, his arm hurt and he knew something was wrong. Nevin underwent Tommy John surgery on his right elbow that year, which was performed by Padres team physician Dr. Jan Fronek. Since having his elbow rebuilt, Nevin has focused solely on hitting and defense. As Grand Junction's third baseman, he mans the left side of the infield with Brendan Rodgers, the No. 3 overall pick in the Draft by the Rockies. "It's cool. We look at it like we're the future," Nevin said. "We're not saying we're going to be [in Colorado] in three or four years, but we're going to work hard to do it. I met [Rodgers] when we signed and it's been fun getting to know him. It's fun knowing that he could be my teammate and we could be playing side-by-side for the next 10 years." For now, it's all about finding a niche and becoming a better player. "It's fun," Nevin said. "It's been a learning experience and a lot of growing up. I've never really been away from home for this long a period of time. All my friends are going to start going to college soon, but it's the same for me. I'm just going off to play baseball. "It was really different at first -- saying goodbye to my friends and family wasn't easy -- but it was something at some point I was going to have to do." Hot Owl: Of the three first-round Draft picks playing in the Pioneer League (as of July 8), Orem catcher Taylor Ward is off to the best start. Ward hit.364 through his first 15 games with a .429 on-base percentage. His 20 RBIs ranked third in the league. Defensively, Ward had just two errors in a league-high 115 total chances. Streaks aplenty: As of July 8, six players had active hitting streaks of 10 or more games, led by Orem outfielder Kyle Survance Jr.'s 13-gamer. Survance Jr. continues to adapt well after signing with Angels out of the University of Houston and is the only player in the eight-team league hitting better than .400. (All-)Star power: In 2014, nine Pioneer League alums were named to the Major League Baseball All-Star Game. This year that number has grown to 12, and five players are making repeat appearances: D-backs first baseman Paul Goldschmidt (Missoula, 2009), Reds third baseman Todd Frazier (Billings, 2007), Royals catcher Salvador Perez (Idaho Falls, 2008-09), Marlins infielder Dee Gordon (Ogden, 2008) and Brewers reliever Francisco Rodriquez (Butte, 1999).